The world is literally drowning in waste plastics. Can we redirect the stream into long-lasting building materials? I won’t spend a lot of time elaborating on our global plastic addiction. Suffice it to say, the stuff is taking over. We’ve polluted our oceans and seafood with it, laced our drinking water with it, and are now using (and throwing “away”) more of it than ever. We need an intervention. Perhaps that intervention could come in the form of an embrace. Given the season of storms and flooding we just experienced, plastic-based building materials are consistently looking better. In the least, we could keep some trash out of landfills and waterways. At best, we might create a whole new way of building, with durable, flood-resistant materials. Although not without its drawbacks, the right time is now for lumber and other building products made with recycled plastic. But Andrady acknowledges that the plastics industry “has its share of environmental issues.” It is based on a linear flow of nonrenewable fossil fuel resources via useful consumer goods into the landfills. Lack of cradle-to-cradle corporate responsibility and design innovations to allow conservation of resources is responsible for this deficiency. For plastic to remain a viable, useful material, full transparency about the products and processes is needed. We must acknowledge plastic’s down side—the perils of toxic emissions, ocean contamination and harmful byproducts—and address them directly. Which leads back to the question posed by this article: Can the linear life cycle of plastics be interrupted on a large scale by the building industry, diverting post-consumer plastics to be used in construction? I believe it’s possible. But it’s a shift that will require new thinking from industry and consumers. The dire problems we now face from plastic pollution may hold within them solutions to other issues around housing and resilience. 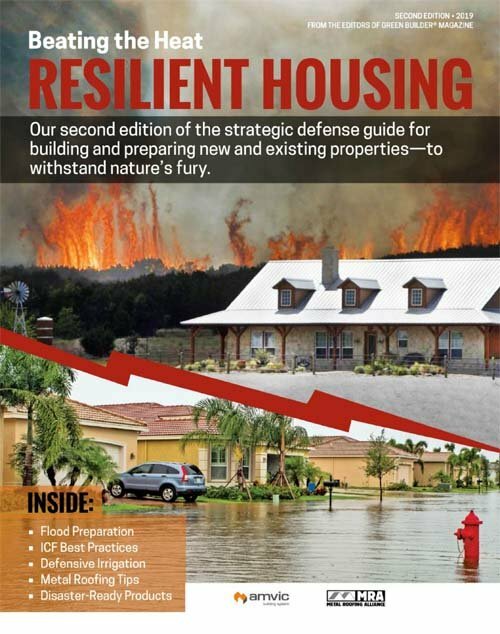 Imagine durable plastic walls and framing required by code in flood-prone areas. Just hose it down after a flood event, with no rebuilding or untold tons of landfill waste. Typical tensile strength for “sheathing grade” plywood, according to MatWeb, is 4,000 to 5,000 psi. Its flexural modulus is about 149,000 psi. 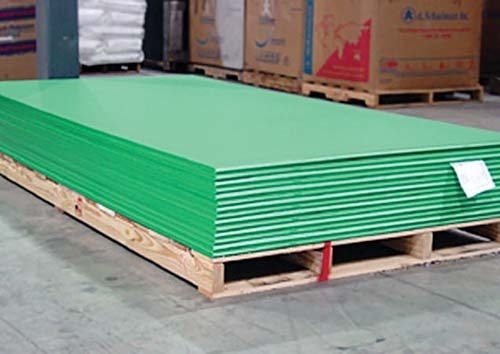 In other words, plywood and plastic sheets have similar strength characteristics when temperatures are mild. The full specs can be found at http://bit.ly/2y51orb. Before we get there, however, we need more honest, third-party research and a commitment to closing the life-cycle loop—not just more use-it-and-toss-it mentality. What do we really know about plastic’s potential in the built environment? Research on the topic tends to focus myopically on one engineering challenge (such as UV resistance) or entirely ignore the big questions of durability and end-of-life prospects. Information on plastics is complex and variable. One challenge is that no two types of plastics have the same physical properties. For example, vinyl siding, made with 80 percent polyvinyl chloride, is probably the plastic material most familiar to homebuilders. The industry-funded Vinyl Siding Institute (VSI) is the best-known source for information on the performance and fate of PVC siding. VSI, however, often narrows its product R&D to “silos” of inquiry. For example, a 10-year study of vinyl siding that started in 1994 (VS4W) looked at the “color ellipsoid” of installed product, not whether it became brittle, warped or caused any moisture damage to sheathing. Too often, the really big questions are ignored, skipped or buried in dense academic research that’s indecipherable to anyone but a chemist and/or engineer. Plastics behave differently as the temperature increases. Each has different tensile strength and load-bearing ability at specific temperatures. These are key factors in determining how and where plastic-based materials can be used in construction. Dimensional Tolerances: Tolerance limits were established that would meet industry requirements and performance considerations. Creep: The viscoelastic nature of RPL makes it susceptible to creep at sustained loads at elevated temperatures. A methodology was developed to use creep data per ASTM D 6112 to define design limits to avoid excessive deflection and creep in the decking boards. Flammability: ASTM’s fire test method uses a small ignition source, as might be expected on a deck, when hot charcoal briquettes from a tipped over barbecue grill make contact. Allowable Material Properties for Structural Design: A complete methodology was presented in the standard to determine allowable maximum span lengths for decking boards based on the material properties determined from the test methods listed above. Some plastics get soft at relatively low temperatures. For example: HDPE, the plastic used in most milk jugs, begins to soften at 172°F under low stress, but about 114.8°F under high stress. A Denver-area deck builder tested surface temperatures (http://bit.ly/2zVFATn) of various deck materials at 87°F ambient temperature in full sun. He found that virtually all deck boards, including cedar and plastic composites, soared above 150°F, well past the heat deflection point of all common plastics. Of course, building standards, such as reducing the joist distance, can compensate for some polymer weaknesses. But designers who use RPL also face a new, emerging variable—extreme heat. Progressive temperature rise and temperature spikes are expected to increase in coming years, due to climate change. Most thermoplastics do not fully melt until they reach about 250°F (HDPE melts at between 248°F and 356°F), but they become soft and bendable long before that benchmark. Deck tests in Boston found that decks typically get up to 76°F hotter than the ambient air (in full sun). Of course, outdoor temperatures would need to approach 174°F before the plastics would completely melt, but in the American West, ambient temperatures frequently exceed 100°F. Sun-exposed HDPE products without additives could easily exceed their design limit (100°F + 76°F = 176°F). American Plastics, for example, lists 170°F as the maximum temperature acceptable for its recycled HDPE sheet polymer. Another concern with plastics, of course, is fire. Polymers are not especially ignition prone, but they burn hot and fast, igniting at about 540°F. As high-carbon materials, however, plastics tend to give off a very dense black smoke. The level of toxicity varies by material, but at the very least it’s disorienting and difficult for firefighters to navigate. As engineer Geoffrey Pritchard notes in Reinforced Plastics Durability, adding fire retardants to plastics has pros and cons. They will work, but “there can be adverse effects on processing, mechanical properties or chemical resistance.” In other words, the material becomes less workable. Another growing problem is the use of pouches that combine aluminum and plastic layers. They’re notoriously tough to recycle. Dow Chemical is reportedly working on a recycling solution. Fortunately, new methods of marking and recycling plastics are being tested, at least outside of the U.S. For example, Ioniqua Technologies, based in the Netherlands, has developed a way to separate plastics from the additives that give them color or other properties. As reported in a white paper by Ethical Corporation, “When PET is added to the magnetic smart liquid that Ioniqa has developed, and then heated, the PET depolymerises. The colourants and other contaminants are removed in a magnetic field, to leave the original building blocks of the polymer.” Those building blocks can be used to create new PET, over and over again. 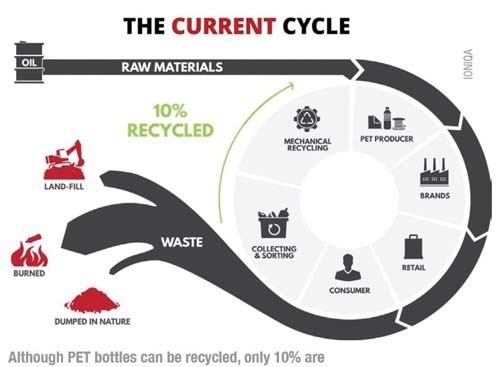 That’s a big advantage, because at the moment PET can only be recycled up to six times. The total recycling rate of HDPE, LDPE and PET in the U.S. was 8 percent in 1996, and has now increased to only about 10 percent for HDPE, 5.3 percent for LPDE and 19.5 percent for PET (data from 2015 http://bit.ly/2zk3WoF). Less treated wood. Plastic lumber can replace treated wood, which is still considered a hazardous waste material by most landfills. Although modern treated wood has far less (if any) chromium or arsenic, it is still infused with copper, making it hard to reuse. Alternative to tropical and redwoods. Plastic wood has many of the desirable durability qualities of pricey (and sometimes endangered) South American and Asian wood species such as teak and ipe. It can take some of the pressure off of endangered forests, although other threats such as palm oil production have replaced lumber sales as the biggest source of deforestation. Flood resistance. With its natural resistance to rot and mold growth, some plastic lumber is ideally suited for use in wet or high flood risk locations. Garden friendly. Although more research is needed, some early studies of plastic lumber in marine environments found very little leaching, compared with treated wood alternatives. This makes it a good candidate for garden hardscapes and beds. Lower GHG than concrete or metals. On a pound-for-pound basis, plastic is less resource intensive than creating Portland cement or melting down metals. Recycled material has far more of an edge than virgin production. And, of course, plastic has durability on its side. It should last for decades, before being recycled again. A few building product manufacturers have recognized the ethical importance of recycled plastic content—and its potential to improve their bottom line. Interface (www.interface.com), for example, has recycled about 309 million pounds of plastics over the past 20 years. The late CEO of Interface, Ray Anderson, set a goal of freeing the company completely from use of virgin materials, and the company seems to have remained committed to that idea. Its carpet backing material, Glasbac, contains about 98 percent recycled material. But in the long view, Interface and others have barely scratched the problem. The carpet industry still dumps about 4.5 billion pounds of end-of-life product into landfills every year. I’d also be remiss not to give a caveat to Trex (www.trex.com). 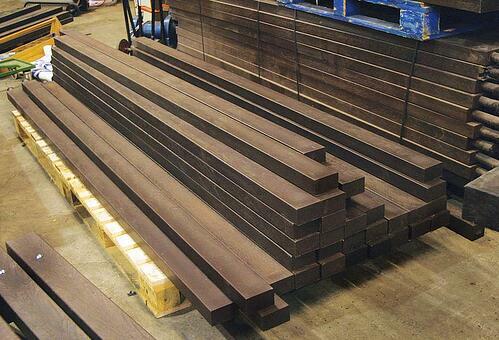 Back in the 1980s, this company arguably launched a whole industry of composite decking where none existed. It has proven that profit and recycling can be close bedfellows. And it has shown how to be more flexible, not less, in terms of the types of plastics that are eligible. Trex currently processes grocery bags, bread bags, case overwrap, dry cleaning bags, newspaper sleeves, ice bags, wood pellet bags, Ziploc and other re-sealable bags, produce bags, bubble wrap, salt bags and cereal bags into their 95 percent recycled decking products. 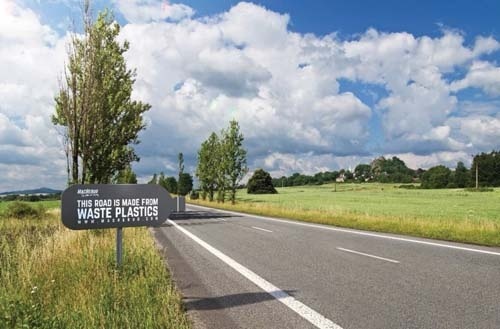 Could 100 percent recycled plastic roads become reality? According to motortrend.com, it’s already happening. A company in the United Kingdom, MacRebur, is already testing at least two roads made with recycled plastic replacing much of the asphalt bitumen. Typically, bitumen accounts for about 10 percent of the asphalt mix, but it comes at a high environmental and financial cost. But not every plastic-lumber company can boast the same eco-awareness. It’s important to read the fine print. Companies such as TimberTech for example, use only virgin PVC in their decking, resulting in a far less sustainable product than Trex. Why do manufacturers deal only with “virgin” plastic? They say it’s easier to work with and more consistent. But the American Society for Testing and Materials (ASTM) has created performance-based industry standards for plastic lumber products that ensure that recycled content does not reduce the performance of end products. In December 2001, there were about 30 manufacturers of recycled plastic lumber in North America, according to ASTM. That number appears to have declined, but getting an accurate head count is tricky. The last major third-party report on the industry by the Healthy Building Network was published in 2005. And activity by the Plastic Lumber Trade Association seems to have frozen in time at about 2007, with few updates to their listings or publications. I tried to contact a couple of the resellers of plastic lumber, but at time of writing, neither had responded. The RPL business can be rough and tumble. Many innovative upstarts have failed. For example, Correct Deck, an RPL company that made composite decking with HDPE had a factory in Maine, but ran into liability issues—specifically related to mixing organic materials in the right proportion with plastic and “capping” deck surfaces anti-microbial material. (I installed one of their decks 12 years ago and it still looks great—just a little spotting.) Consumers are extremely intolerant of any discoloration in their surfaces. The market opportunities for RPL have never been better. Sure, there are challenges to using these materials. But when you factor in the fact that plastic trash is ubiquitous, free and in overwhelming need of a cleanup, the building industry could provide an ideal solution. Imagine basements that never leak, lightweight roofing with cradle-to-cradle credentials, impact-resistant siding and rot-proof joists and 2-by-4s. All of these innovations are not only possible, but available now. It would be great to see some more American companies join the growing field of plastic lumber manufacturing. An overseas company called Eco Tiles makes attractive floor tiles from recycled plastics, but their method of collecting and separating the right polymers raises health and safety concerns. In other parts of the world, reusing plastic in construction is an up-and-coming niche. This small machine below, which combines recycled plastic and sand to create roof shingles, has attracted interested buyers from all over the world. Setup costs €25,000 ($29,000) according to the seller, Andrey Kolev, who is based in Bulgaria. The company (http://plasticabg.net), can make the moulds from a drawing; total prep time is three months. The unit requires 20 kW to operate and can make 60 pieces per hour. The total factory area required is about 215 square feet, not counting storage. Stabilizers and resins can improve the performance to some degree. For example, the bendability of plastic lumber can be decreased by adding fine mineral fillers, such as talc to the mix (http://bit.ly/2hJp8e9). Generally, the smaller the particles added, the greater the boost in stiffness. But the original plastic resin begins to lose impact strength as the level of fillers increases. 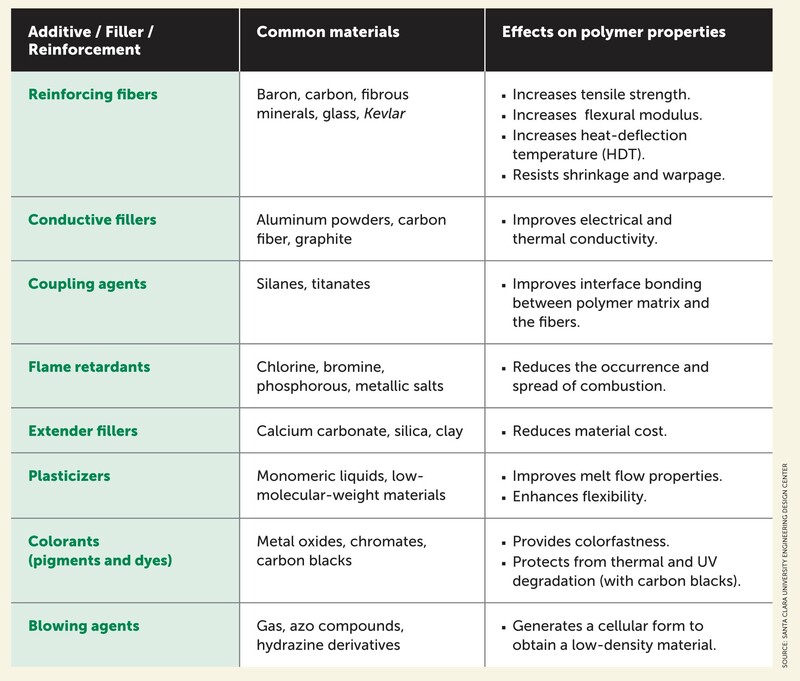 Here’s a chart showing effects of other additives on polymers. D 6435 (www.astm.org/Standards/D6435.htm), Standard Test Method for Shear Properties of Plastic Lumber and Plastic Lumber Shapes. There no longer seems to be an industry-managed list of current recycled plastic lumber/building product manufacturers. I’ve done my best to collect a list of every active company I could find. You’ll need to read the fine print to determine which ones use recycled material (and what percentage). The only other list of this type that I’ve seen is rather dated, from a 2005 report. Contact us if you know of others that should be added to the online edition of this article. Fabricating doorknobs, hinges and tiles from recycled plastics could soon be the new normal. The reliability and speed of 3D printers is increasing. At the same time, the cost for a household-sized unit is dropping. It’s a classic “Moore’s law” technology story. What does this mean to building pros? Maybe more than you think. I’ll reiterate my prediction that we’re moving toward a time of localized manufacture. It’s not quite Star Trek yet, where a device recombines materials at the atomic level to form matter, but maybe an early iteration of that idea. And plastics—especially recycled plastics—are a widely available, free material that’s optimal for 3D printing today. 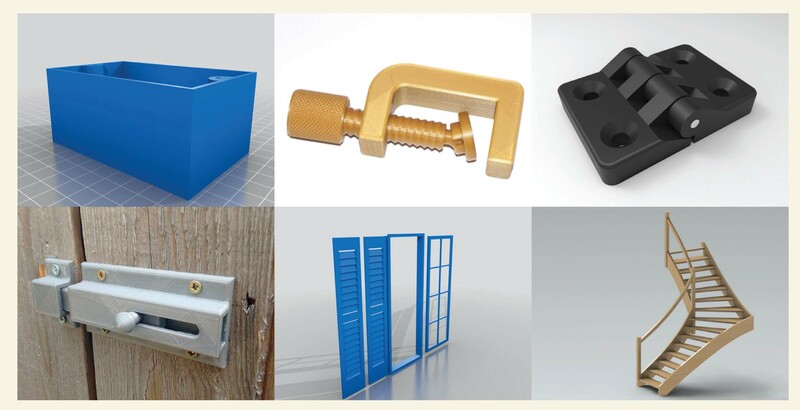 The products shown, from Thingiverse, are just a small sample of what’s to come for 3D printing. From an engineering perspective, plastics fall into two broad categories: thermoplastics and the thermosets. Thermoplastics refer to those plastics that soften and flow on heating, allowing them to be molded or formed into different shapes. Thermoplastics can therefore be recycled as they can be melted and reformed into different products (Subramanian, 2000).